Chinoiserie Palm pattern shown below on a saucer. The pilchards were caught in large schools by nets and carried onto the shore where they were salted and stacked up in the nearby cellars. The fish oil ran into gulleys and was sold to the Navy. The fish were then pressed and sealed into barrels for distribution. This was a booming business. The dinnerware with "UNITY" motto or logo may have been used for the annual investor's dinner. A dinner plate in this Long Bridge pattern with the Unity name and pilchard with impressed "Swansea" mark was documented by Nance, E. Morton. The Pottery & Porcelain of Swansea & Nantgarw. London: B. T. Batsford Ltd. 1942. Plate XIII (E). Shown here is an earthenware saucer 5.5 inches in diameter printed in blue in the Chinoiserie Palm pattern along with the "UNITY" name and pilchard. An indented plate printed in blue in the Long Bridge pattern with butterfly border produced at Swansea. The plate, one of many, was commissioned by the "Unity" Pilchard Cellar at Newquay. Unity was one of nine pilchard cellars in Swansea by the end of the 19th century. 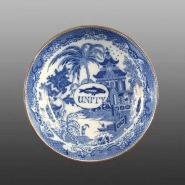 The oval cartouche showing a pilchard above the word "UNITY" was used on two different patterns; this one and the Chinoiserie Palm pattern shown below on a saucer. The pilchards were caught in large schools by nets and carried onto the shore where they were salted and stacked up in the nearby cellars. The fish oil ran into gulleys and was sold to the Navy. The fish were then pressed and sealed into barrels for distribution. This was a booming business. The dinnerware with "UNITY" motto or logo may have been used for the annual investor's dinner. A dinner plate in this Long Bridge pattern with the Unity name and pilchard with impressed "Swansea" mark was documented by Nance, E. Morton. The Pottery & Porcelain of Swansea & Nantgarw. London: B. T. Batsford Ltd. 1942. Plate XIII (E).